While he's gaining more notoriety today as head coach at Ohio State, John Markell first made a name for himself in the collegiate ranks as a player at Bowling Green. 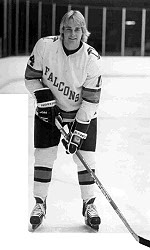 With the Falcons, Markell helped his team to an impressive 117-34-4 (.768) overall record from 1976-1979, a 57-15-2 (.784) ledger in CCHA play, three regular season and playoff titles and a NCAA semifinal berth. Markell was a four-year letterwinner and served as an assistant captain as a senior on a team that went 37-6-2. He was BG's leading scorer as a junior with 61 points after leading the team in goals as a sophomore with 26. Markell currently ranks sixth on BG's all-time scoring list with 235 points while his 102 career goals ties him for seventh with Brian Holzinger. His 133 career assists places him ninth on the BG all-time list. The Cornwall, Ontario native was voted BG's outstanding forward in 1978 and 1979 and won the "Gay Blade Award" for Best Attitude all four years. Markell was CCHA Co-Player of the Year as a junior and was selected to the CCHA First Team his last three years after earning honorable mention accolades as a freshman. In 1979, Markell signed a free agent contract with the NHL?s Winnipeg Jets after being offered and declining a spot on the Canadian Olympic Team. His first season with the Jets was a memorable one, as Markell netted the team?s rookie of the year award. His NHL career spanned four seasons and included stops in Winnipeg, Minnesota and St. Louis. He accumulated 21 points (11 goals, 10 assists) in 55 games. Markell?s tour through the professional hockey ranks also included seasons with the Tulsa Oilers (Central Hockey League), Salt Lake City Golden Eagles (CHL), Montana Magic (CHL) and Springfield Indians (American Hockey League). In 1985, Markell signed a pact with the EC Bad Nauheim club team based in Germany before leaving that squad for Wolfsberg, Germany. It was with ESC Wolfsberg that he began his coaching career as a player-coach. The Cornwall, Ontario, native returned to the United States to join Ohio State's staff as an assistant prior to the 1993-94 campaign.